I just want to start this by saying sorry for not posting anything last week. 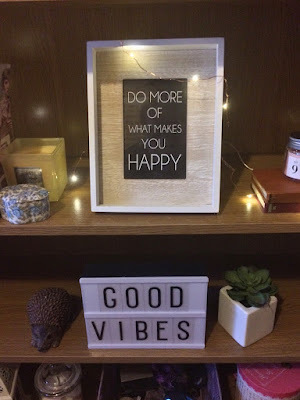 I know I usually post on either a Tuesday/Wednesday and then on the weekend but if you've read my previous post, then you'll know I've been feeling really rubbish lately. I've lacked motivation for anything over the past few weeks if I'm being honest. I think it's because it's this time of the year when I do get quite down very easily and it kind of lingers. Also I haven't wrote about this yet on my blog but another reason why I'm feeling low is because I quit my job in September. I'm not regretting it whatsoever. I was unhappy there, I was bored and I needed a lot more contracted hours a week too. But because it's been over a month now and I haven't really seen many jobs about in my area that are enough hours, suitable or I have experience for. It it has started to make me feel stressy. I know something will come along at some point but I'm living off savings which I started to save up once I began thinking about leaving my job. I do know now after leaving that I'm in a better place mentally than I would've been if I stayed there, but obviously I feel as if I'm living on borrowed time because the money will run out at some point. And here I am writing about a retail therapy shopping trip in Chester... I know. But to be fair I can literally count on one hand the amount of times I've left the house over the past week because of the lack of motivation mood and just feeling low, meaning I hadn't really spent any money. So I thought why not? I'll treat myself to some new things and it might cheer me up... and it has. So here's what I picked up! I've had my make up case for almost a year which was also from Primark but I felt like a change and it was getting a little tatty. But I'm going to put my nail polishes in there for now. The new make up bag is pretty. It's not something I'd usually go for but it's growing on me. It was only £4 and it fits all my usual daily make up in. It's like an Mary Poppins bag. It looks like it won't fit everything in but it does. Another good thing about the new case is it's a baby blue colour inside, so it'll be easier to find my make up than my old case which is black. I'll admit I didn't need new eyelash curlers or tweezers but they're rose gold! I couldn't not buy them especially the fact that they were both only £1! I've used them both since taking the photos and they're both really good. 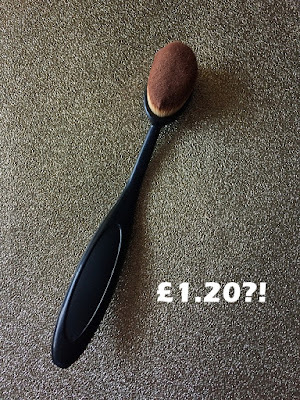 Who needs expensive beauty tools when you have these bargains? 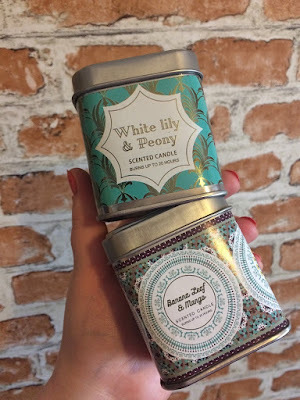 I really wanted to get the pear and blue mint scented candle which I saw online because the tin was so pretty, but couldn't see it anywhere. So I got this one. Really nice scent, very fresh but delicate. Peony is one of my favourite scents too. The pattern on the tin drew me to this one I'll admit. I thought it'd smell like a really sickly banana scent, like the medicine you have when you're a kid. But the scent happens to be really nice too. So it was a win/win. Think these would make cute little stocking fillers for Christmas. They're only £2 too! 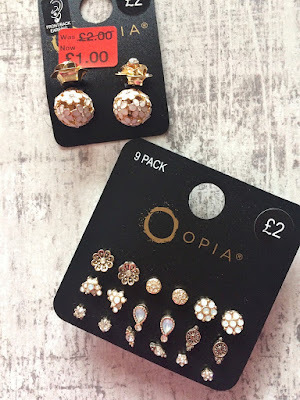 I'm pretty sure it's an unwritten rule that when you visit a Primark, you have to buy their cheap earring packs. 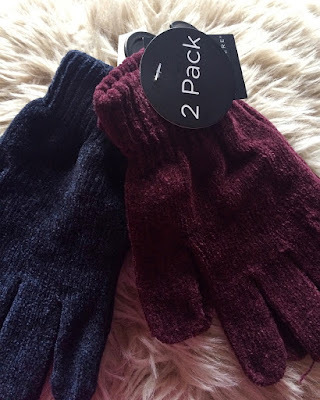 £2 for 9 pairs... don't mind if I do. I will say that in the Chester Primark there wasn't as much choice than there is in my local Primark in Hanley but these are still pretty. Love the dream catcher pair on the second row. I saw these online before visiting and I first thought they were a pair of earrings you could wear either way. But that's not the case. The golden flower is the front and the round floral ball (which I like the most) is the back. Because they're quite heavy, they tip my ears up a little, so it looks a little strange. I have put them in my ears the other way around, so the side I prefer is at the front but they still don't look right. I don't know if it's because I usually wear small studs and me or my ears are used to something different. But they were only £1 in the sale. Even though my hair has gone quite thin (for some reason) hair bobbles snap on me all the time. Especially when I'm wearing my hair in a messy bun. I've found that the Primark bobbles (the thinner ones) are the best for my hair right now, so I always pick some up when I visit. I think think theres either 50 or 100 pairs for £1. I wanted the black and white check ones really but there was none in my size. But I do really like these. I always seem to go for check things this time of the year. I think it's because Christmas is on my mind. I will say that the sizing isn't the best for these, so either try them on before buying or go up a size. Best thing is their price... £4! They also have some fairisle printed ones for the same price, if you're wanting to buy yourself or someone else some Christmas pyjama bottoms. It's definitely getting colder now. Some days it feels quite bitterly cold, some days aren't so bad. But I thought I'd buy some new gloves for bonfire night next week because I normally forget to take a pair with me. These were only £1. I'm blaming my cousin for why I had to buy this when I've already got 4 or 5 bath bombs to be used. 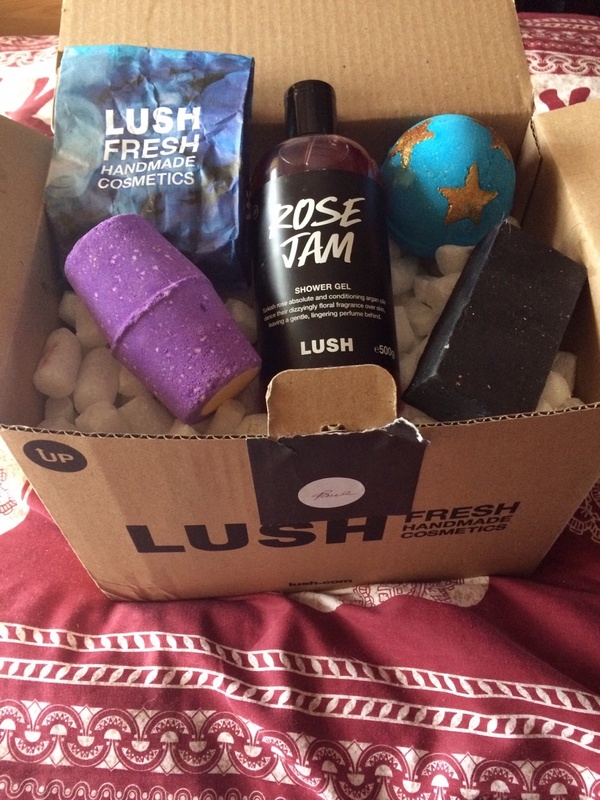 On my last Lush haul which you can read about here, my cousin bought some things too. 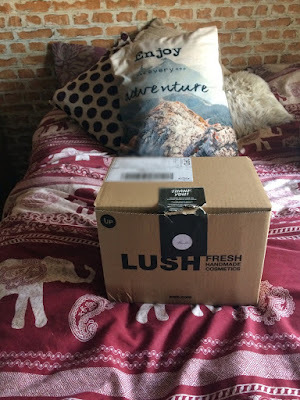 When the delivery arrived I could smell one of the products and I thought it was my Northern Lights bath bomb because I knew it smelt floral but it was this one. The one I didn't buy lol. It smells really lovely, pretty much the same as the Rub Rub Rub shower scrub. I never really thought to buy this bath bomb because I knew it wasn't a colourful one but I already know I'll definitely be buying this again. I use the Snow Fairy shower gel as shampoo as well as the shower gel. I usually use it as a shampoo when I'm having a pamper. So I use it a lot quicker than other Lush shower gels I've got. This years batch isn't as powerful as last years which I'd prefer, because the bottles I bought last year were almost a little sickly. It's still got it lovely candyfloss scent which reminds me of going to the fairground when I was a kid. I didn't buy this whilst in Chester. I ordered it the night before. 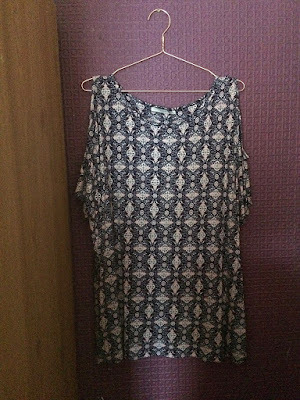 I almost got the top in the summer but because I've got a big collection of cold shoulder tops I thought I wouldn't buy it. 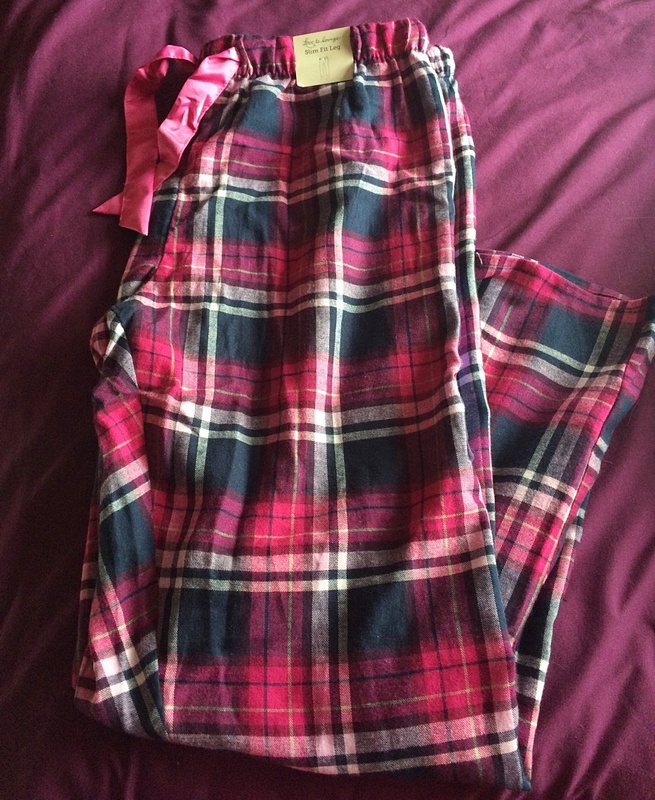 But then when I gave in and went to buy it, it'd gone out of stock in my size. So when I was on their site on Wednesday evening, I was surprised to see it in stock again. And at a reduced price of £3. So I had to buy it. I plan on wearing it to a family party I'm going to at the end of November. Not sure on what else I'm going to wear it with yet though but I'll figure it out. I thought I'd already bought this before but it must've been another scent because smells different than what I initially thought. But it definitely smells like you've been baking at home. Really lovely. 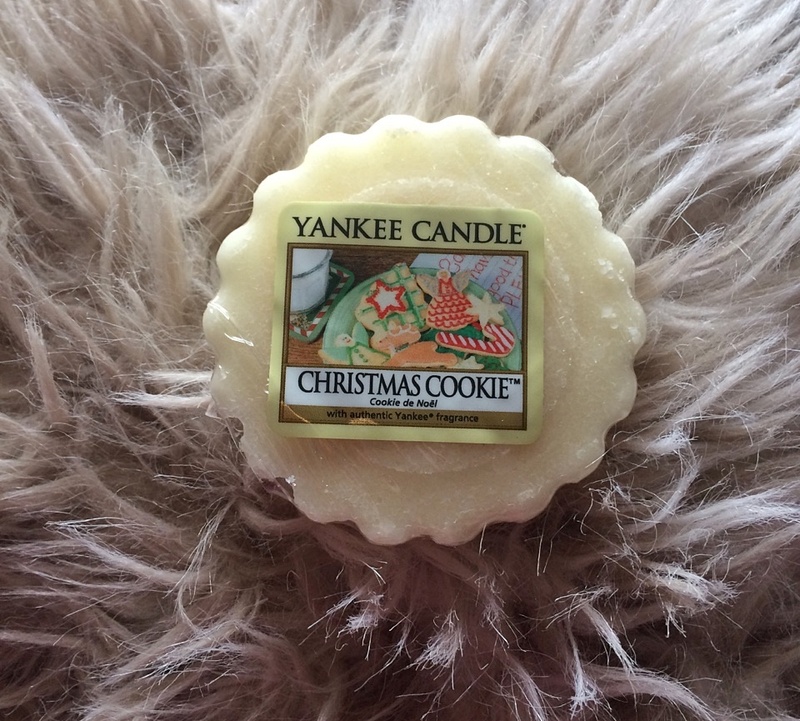 New favourite Christmas scent from Yankee Candle. Going to be buying more of these. So I won't lie. This is basically a late "September Favourites"... I have bought a lot of new things over the past month, so I thought I'd share my favourite buys. My bank balance probably isn't very happy with me but oh well. Some of them are things that everyone else seems to be using, so I jumped on the bandwagon and gave them a go. Some of things that have caught my eye and I've just decided to buy them. 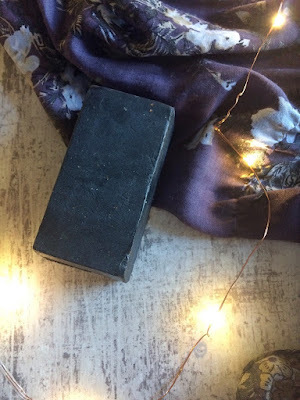 So if you've been following my posts on this blog then you'll know that the Coalface soap from Lush is my holy grail skin care product. This is almost knocking Coalface off the top spot because it's that good. I bought this because I had a really bad breakout going on and I was shopping on the Superdrug website for other things and I happened to come across this range and the reviews were all good. So I thought I'd give it a try? Another reason why I bought it is because it is £2.69! so it's a bargain. It's a strange consistency it's like cream/gel, you only need a small amount (about an 10p piece) but about two days after using this, my skin was clear. I still get breakouts but no where near as many as I used to get. So this is something I'm definitely going to be using from now on in my skin care routine. I didn't know about using this as primer until earlier this year. No I haven't been living under a rock lol, I just hadn't really been following the skincare/make up trends if I'm being honest and was just using my usual go to products. So I saw it on offer and I thought I'd give it a try. It does the job and my make up stays on for so much longer. It makes my skin look more clearer and glowy and I love it. 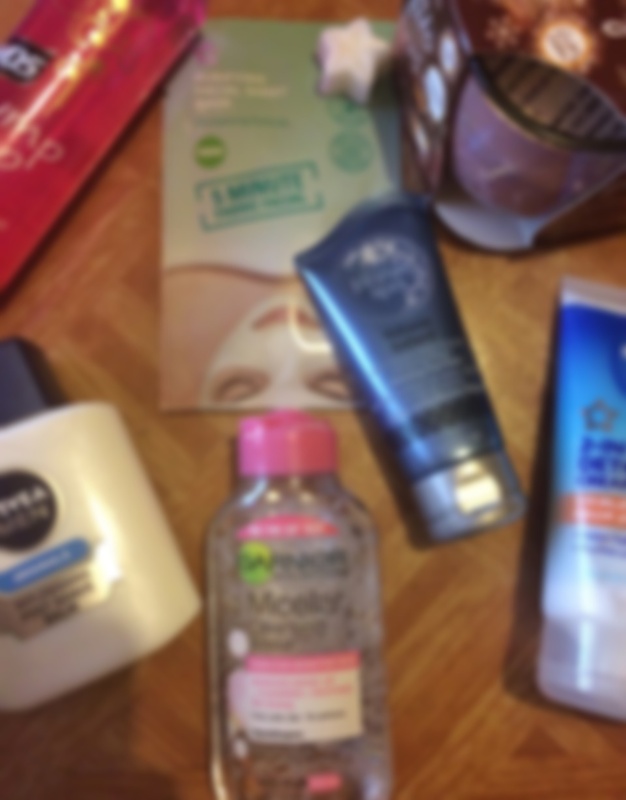 Why is it, every micellar water bottle claims it won't sting your eyes when they usually do? I don't have really sensitive eyes either, so I don't know how these people who do have sensitive eyes get by. I was a little apprehensive when buying this because I I've tried a Garnier micellar water before and it made my eyes sting for hours and it gave me so many spots because it was so oily. But most of the reviews said how good this was and how it didn't sting their eyes or break them out. So I gave it a go and it did remove the make up well from my eyes but if I use it every day it does sting them which is kind of strange. So I tend use this here and there as a eye make up remover but I do use it to remove foundation, lipstick etc and it doesn't break me out like some have. I have so many different face masks right now, but a face mask I haven't tried for a long time is a sheet mask. It was only £1.29 too. I put it on one evening after having a nice relaxing, bath and kind of regretted it because it smelled very strong of tea tree and peppermint. It woke my skin up loads and I think it was probably the reason I didn't sleep well that night. So I definitely recommend applying this mask in the morning or afternoon. It's very cool and refreshing. I usually leave them on for 5-10 minutes and then follow the instructions of rubbing any leftover product into your skin and then rinse with cold water. I've bought some more since in the 3-for-2 offer that's on at the minute. So when I ordered this I thought it was one of those masks that works when you splash your face with water first, apply the mask and then leave for 10 minutes. Instead it's a 2-3 minute face mask that you massage in with water and then rinse away. So yeah, it isn't really an face mask. But it does work amazingly. If you have a painful spot that is under the skin, it helps to bring it to the surface. And my face feels so clean and smooth after every use. The only downside to this product is it is very small (50ml) and I think it's been discontinued but you can buy it on Amazon but it's priced at something silly like £7.99. I don't really know what's happened to my hair. It used to be quick thick but now it's gone kind of fine but frizzy. It's strange. But I bought this because I used to use the plump it up shampoo and conditioner a while ago. It's so good, it make my hair look more voluminous. I tend to spray it more on my roots and then apply serum to the mid lengths and ends to try and calm the frizz down. But my hair looks more fuller, shiny and healthier when I'm using this. Not too keen on the smell because I think it smells like cheap hairspray but it's something I'm willing to put up with and thankfully the smell doesn't linger in your hair. I'm a sucker for cute little fairy lights. I did used to have some over my bed but they broke so I bought some bottle lights instead which I love. But I saw these copper effect wire lights and thought they would look nice on my bookcase. They were £1.99 and then £1.99 delivery. They give off a lovely warm, glowy light. They are quite fiddly to get them where you want them to go but if you have patience, they are worth it. Click here if you're interested. This is such a lovely scented candle. Smells similar to a yankee candle I've had before but I can't think what it was called. This is honey and chocolate scented but it doesn't smell like honey and chocolate. It's kind of weird. It smells a tad masculine I guess. I think it's in with the Glade Christmas range. Because the other scents with it were very winter like (Apple and cinnamon etc) Definitely going to stock up on these before they disappear after Christmas. They range for £1.49 - £4 depending where you shop. 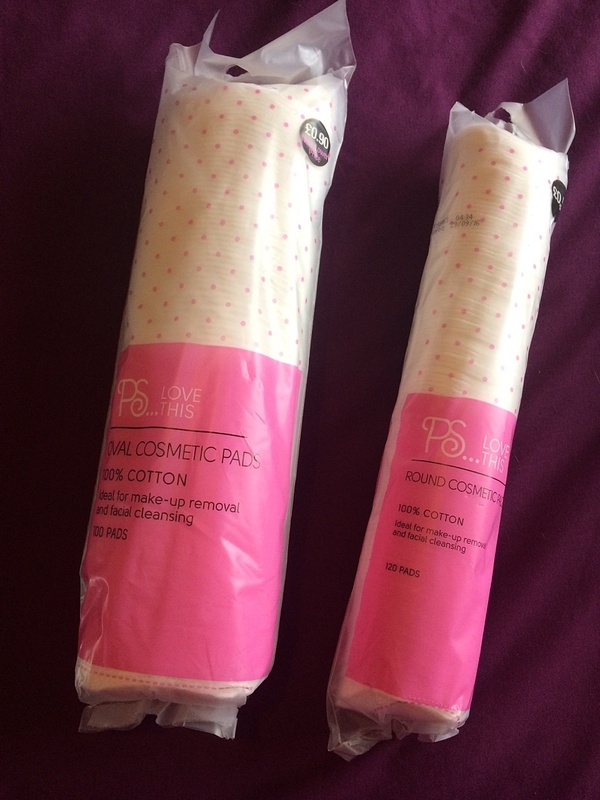 I bought my first one from b&m for £1.49 and the second one was from Sainsburys for £2 in a different packaging. So these wax melts are £1.99 for 10 in an assorted bag or you can have 10 of one of the scents. I bought an Airwick electric wax burner earlier this year and it's one of the best things I've bought this year. I was getting through so many candles so I thought I'd buy one of them instead. I used to buy these on Amazon but they don't sell them on there anymore and they have a website instead and you can find the wax melts under Gifts and Accessories section. The scents in the assorted bag are: Coconut Island, Black Plum and Rhubarb, Strawberry and Rhubarb, Sparkling Lemon, Sweet Pea, Fresh Linen, Luscious Vanilla, Sandalwood and Black Pepper, Coffee Mocha, Jasmine and Patchouli and Fairy Dust. So you can either buy 10 of one scent or buy the assorted bag. Both options are £1.99 with free delivery. You only need to use one at a time and they last for hours. If you're interested then click here to go to their site. Here's my review post about the Lush samples I received in my delivery last week which you can read about here. I was going to write this up sometime this week and post it next week but I've got some different kind of post ideas for next week so keep a look out for them! In the Lush delivery the samples I received were Sandstone Soap, Fireside Soap, Curly Wurly Shampoo and Fresh Farmacy Facial Soap. I have tried some of these before but it was a long time ago so I wanted to give them another go. So here's what I thought about each of them. Hope you enjoy! First up I want to talk about is the Sandstone soap. I would definitely say this is more of a Spring/Summer scented soap but it is very refreshing so it'd probably be good one to use on those mornings you need to wake your body up fast. It's very citrusy and there is some sand present in the soap so it also gives a slight exfoliation to the skin too. It makes you feel like you want to be on a beach in the sun. I think I will be buying this in the future because I do really like it. I usually don't go for citrusy scents but this is lovely. It's quite similar to the Bohemian scent but I do think this one is nicer and prettier. Next up is the Curly Wurly Shampoo. I have used this before in some random samples I received a while ago. I didn't ask for it specifically so when I opened the sample pot I was almost knocked out from the strong scent of coconut. It very overpowering so I didn't actually use it for a while. But I thought one day I'd give it the benefit of the doubt and try it. Once I put it on, it lathered up well and the scent calmed down and a sweet coconut scent stayed in my hair for ages after blow drying and my hair looked more fuller. So because it was about six months since I first tried it I thought I'd give it another go. This time when I tried it, it didn't lather up the same. I had to use some of my coconut water shampoo with it to get a better lather. Then once I blow dried it I had lumps of white coconut clumps in my hair and it looked like I had done an bush tucker trial and got worms or lice in my hair. Not a good look! It did however have the nice sweet coconut scent again. Don't know if it was a bad batch but I wouldn't use it again. Next is the Fresh Farmacy Facial Soap. I have used this before and I do ask for a sample of it here and there as a kind of back up cleanser. 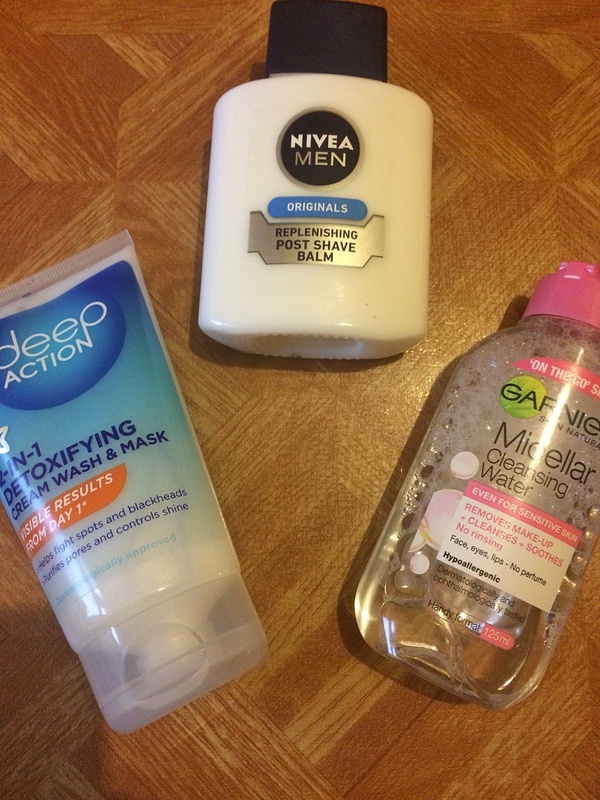 I only tend to use this when I've either washed my face a lot during the day (like in the summer when it's warm) or when skin is feeling a little sensitive or when I'm not well and I just want a light cleanse to refresh my skin. So I don't see the point in buying a 100g because I love my Coalface soap more and use that every single day. This smells similar to the Aqua Marina Cleanser which smells very sea like in my opinion. Unfortunately me and Aqua Marina didn't get along and I had a reaction and my skin went all red then I was covered in spots for about a week and a half. So when I first got a sample of this I was a little wary but it didn't smell as strong as Aqua Marina. It's smells more soothing and relaxing because of the Lavender Oil present too. So I gave it a go and I've used it here and there ever since. If you have sensitive/dry skin then I'd definitely recommend this one. Final sample is the Fireside Soap from the Winter range this year. I loved the flame on this soap and the description sounded lovely. I do love the smell of a bonfire. I would've bought it but it was out of stock when I placed my order. So I thought I'd see if I could get a sample and I did! When I first smelled it I was thinking is this the right soap? It didn't smell like the smoky, woody, winter smell I was expecting at all. It just smells like Cloves with a tad of vanilla to me. So it was disappointing. Then I used it as a hand wash and the scent smelled different than it did when I first got it. So then I used it as a body wash and it was okay I guess. It was more of a spicy vanilla but the smell didn't linger at all. I think the best thing to do with this soap for anyone who is unsure about buying it is to get a sample and try it out for yourself. I feel like it was a bit of a let down... or that my sense of smell isn't working properly. People were saying they could smell the smoky, winter smell and I don't at all. So I'm not going to be buying this one when I next shop at Lush. So there's my sample reviews. Have you tried any of these out before? What did you think? Hoped you liked this post! 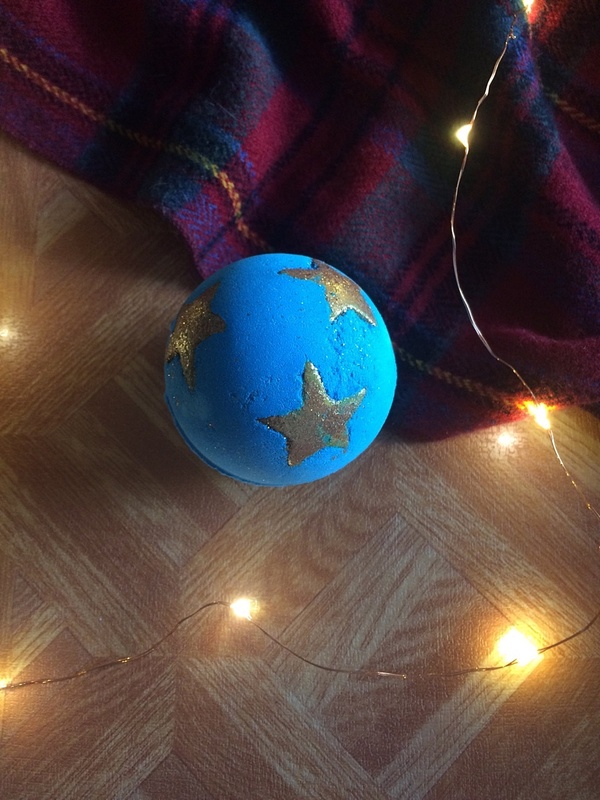 So first thing I chose from the Christmas range is the newly designed Shoot For The Stars. 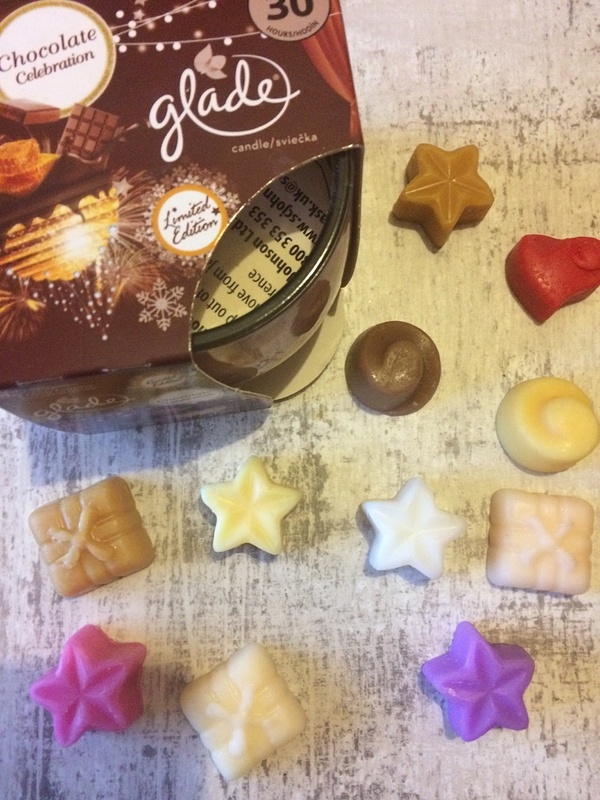 I only bought one of these because I didn't know if I'd like the new display and the bath melt which get's released from the golden stars. Sometimes my skin gets irritated by things like that but I'm really hoping my skin behaves so I can buy more. The smell is the same as usual and is one of my all time favourite scents from Lush which is Honey I Washed The Kids. I think Honey I Washed The Kids smells like Honey and Caramel mixed together. The price of these bath bombs is £4.25. I really hope I like this one as much as the old design. 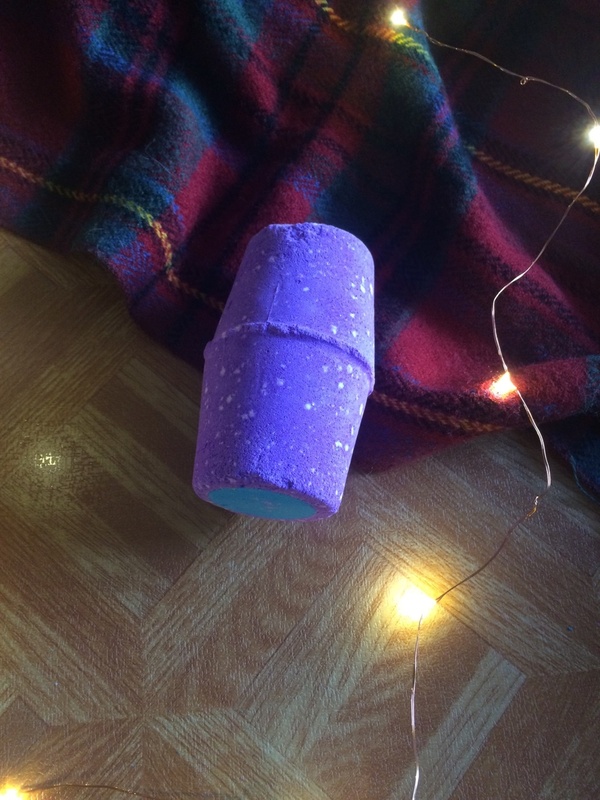 I have kind of got my doubts about it because the old one released a lot of different colours (blue, yellow, pink, purple) so obviously it was a very colourful bath bomb. The new one looks like it just releases an blue colour and then the golden/yellow bath melts cast a golden shimmer over the top of the blue. But we'll see. 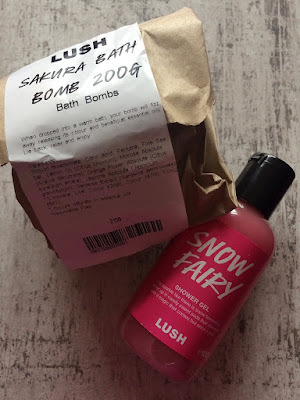 I will more than likely post a picture from the bath bombs I've bought in this mini haul on instagram in the upcoming weeks so you can follow me here to see them if you'd like. Next from my little haul is the Rose Jam Shower Gel in 500g. 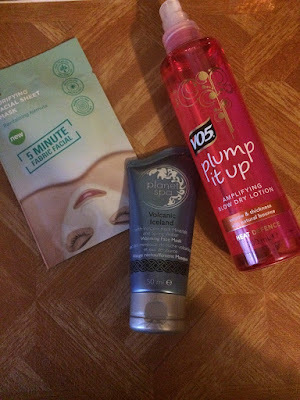 I've wrote about this shower gel already on my blog. I came across it purely accidentally because of the boxing day sales. Because of the usual crashing on the website I just put whatever I could click on in my basket and checked out and Rose Jam was in one of the gift sets I got. (Home For Christmas gift set? maybe?) And I fell in love with it. I've never smelled this scent in anything else before, it's an unusual Rose scent and I find really calming and relaxing after a stressful day. It's one of those smells that you can use all year round as well. So I've basically been rationing an 100g bottle since January this year and now I have the huge 500g bottle, yay! I was going to buy another 100g for now but I found out was going to get an 250g bottle as one of my Christmas presents this year because I'm always going on about it. So I've put the money to that to get the bigger bottle so it'll last me longer. 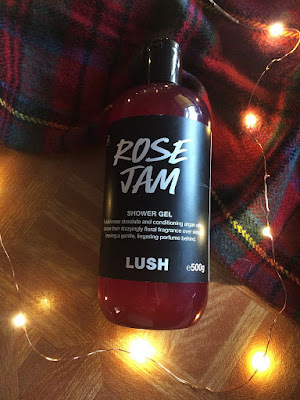 So yeah my Rose Jam shower gel is a very early Christmas present lol. The prices range between: £4.95 100g, £9.95 250g, £16.50 500g and £27.79 1kg. Next is the redesigned Northern Lights bath bomb. 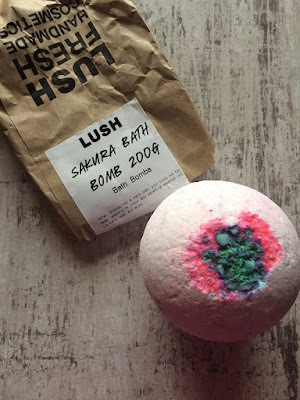 I can't say whether this bath bomb will be as good as the old design because I've never been able to get my hands on the old design. (Yes really) To put it blunt my local Lush shop is in an place which I hate and I only really go there if I really have to. 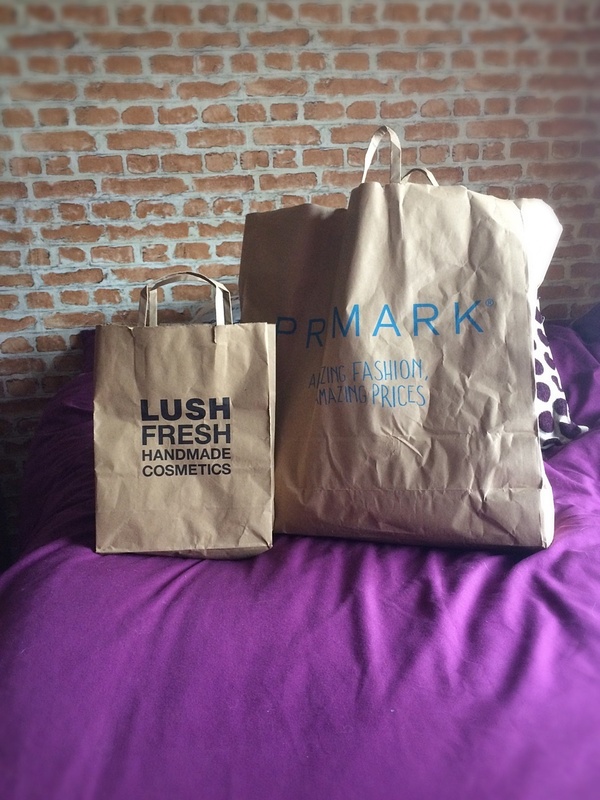 So I tend to order online more than going the shop. But the last time they were in the Christmas range they always seemed to be out of stock online. I really like the new design though, it quite heavy considering it's cheaper than the Shoot For The Stars bath bomb. 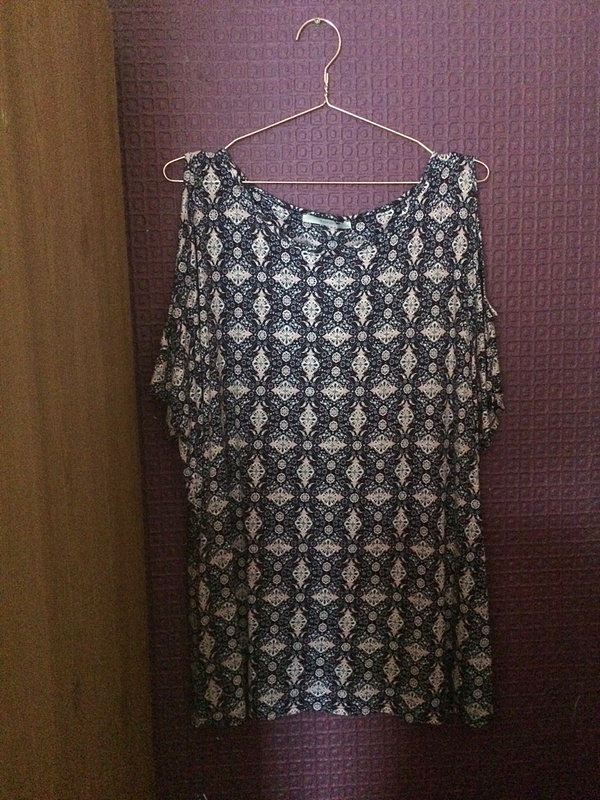 This one is £3.95. It smells very fresh and floral. It's really nice, definitely going to buy another one of these. I think this one would be a nice present too because it doesn't look like an usual round bath bomb because of it's unique shape. Finally is the 100g Coalface facial soap.This isn't a Christmas product but I was running low and it's one of my holy grail skin care product. It's amazing. It's definitely made me skin less angry and it helps to calm down any breakouts. It's smells like Charcoal and Sandalwood mainly. But I have noticed in the past two of these I've had that they smell of licorice more and it kind of overrides the Charcoal scent. Some people may love that but I'm not a huge fan of licorice so it does let it down for me a little but I still swear by it. It's definitely something you should try if you have oily skin. I tend to cut mine up in thirds just because I find it easier to work with and they seem to last me around 5 months. So it's worth the money. The price of these is: £5.95 for 100g, £14.85 for 250g and £29.75 for 500g. I did ask for some samples and I am going to write about them in an separate post in the next week or so. I have tried three of them before and then there's one I haven't tried because it's a new winter range product. 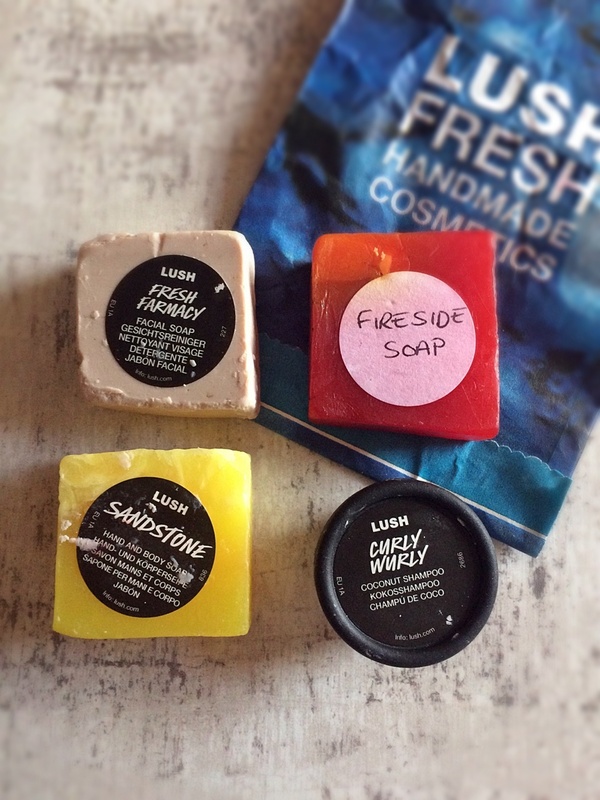 The samples I got are: Fresh Farmacy soap, Sandstone soap, Fireside soap and Curly Wurly Shampoo. So keep a look out for the post about these soon! I'm starting this by saying I'm not going to say it's an Artis dupe like most do. That's just because I've never tried the Artis brushes because I personally think it's way too much money to spend on a brush or a brush set. But I saw the big craze on the toothbrush shaped brushes a month or so ago and thought I'd have a look on Amazon for something similar and a heck of a lot cheaper. I found this Neverland toothbrush make up brush a few scrolls down the page. They charged 20p for the brush! and then an added on £1 for the delivery fee. So obviously I bought it. I will admit it did take a while to get here. I think it was around 3 weeks because it was shipped from China but I'm sure you can probably find an UK based seller. It arrived and It was a little smaller than expected but then again I don't think I looked at the size dimensions when buying (oops). It's like the perfect size for concealer. But I really wanted to use it for foundation. So I got the most water based foundation I have at the minute which is the L'oreal Infallible Pro Matte Foundation (you can read my thoughts about it here) I chose this because I wanted to see if the brush eats up the foundation and if it applies it smoothly and without causing streaks. I'm really surprised to say this but it actually works brilliantly. The brushes are very soft and gentle on the skin. It doesn't move the product around the skin, it goes where it's supposed to go and it gives me an almost airbrushed look. It didn't eat up the foundation or streak at all, I applied a full face of foundation in less than 5 minutes. So it's good for those days when you're running a little late! It covers up any imperfections nicely. The only thing I can say about it which lets it down is that it does feel a tad flimsy but it's probably because I was using an concealer sized brush as a foundation brush. I'm definitely going to buy the bigger sized one. I recommend this for anyone who wants to try these toothbrush shaped brushes but are on a bit of a budget. They won't disappoint! I definitely recommend these to anyone who wants to bag a beauty bargain which gives good results. I'm using this brush more than any other brushes right now. Hope you liked this post and thanks for reading. New post will be up soon!